Ashley joined the Firm in 2011. As the Office Manager, her focus is ensuring everyone at Petersen CPAs is organized and ready for tax season. During the busy season, Ashley never sits down and she LOVES all the activity. She appreciates being able to build relationships with our clients and helping them like taxes just as much as we do. 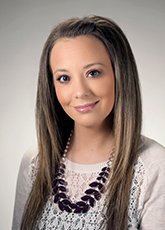 Prior to joining our team, Ashley was a hair stylist for 5 years at Onyx Salon and Spa in Yakima, WA. She attended Yakima Beauty School and received additional education and training through Paul Mitchell and Loreal Professional. In her free time, Ashley enjoys spending time with family and with her precious dogs, Max and Griffey. She loves being outdoors whether it is her favorite summer vacation spot, Cannon Beach, or up in the mountains camping. Fall and winter are Ashley’s favorite seasons because of the holidays and spending time with the people she cares about most. She is especially fond of her first nephew, Lincoln, and watching him grow. Weight in pounds of my dog, Griffey, who was named after Ken Griffey Jr.